President Muhammadu Buhari during his official visit to Dubai, United Arab Emirates (UAE), performed four strategic functions, including appearing before Nigerians who are based in the country for a ‘grilling’ session on his performance in office. 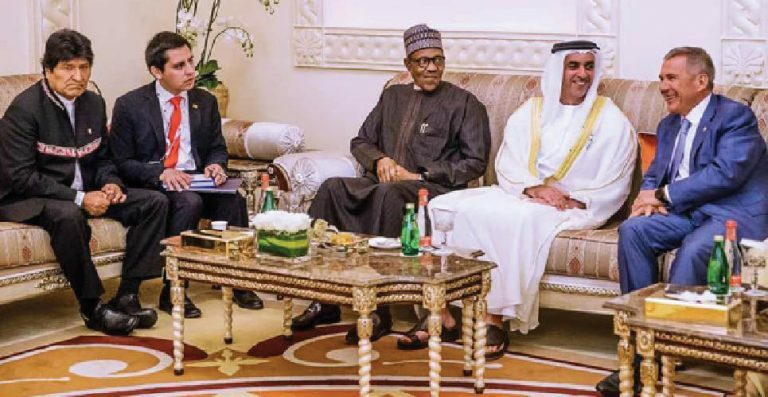 President Muhammadu Buhari who arrived Dubai on Sunday from Jordan where he had participated in the World Economic Forum (WEF) on the Middle East and North Africa, following an invitation by King Abdullah II bin Al-Hussein, kick started his engagement with bilateral meetings on Monday. Invited by His Highness, Sheikh Mohammed Bin Rashid Al Maktoum, the UAE Vice-President, Prime Minister and Ruler of Dubai, as guest of honour at the ninth edition of the Annual Investment Meeting (AIM), Buhari delivered the keynote address at the event. Before he went to the venue of the AIM, Buhari had six bilateral meetings with investors where he wooed them with a pledge of handsome returns on their investment in Nigeria. Kick starting the overture with Sheikh Ahmed Al Maktoum, Buhari told them that they would prosper if they invest in Nigeria. Al Maktoum is interested in establishing a power plant in Lagos, and studies have already been completed. Relevant government agencies including the Nigerian Investment Promotion Council ( NIPC) have been directed to act on it immediately. Same was said to the Lulu Group which operates a chain of supermarkets in the Middle East and Asia. Chairman of the group, Mr Yusuff Alli, told President Buhari that the outfit, with headquarters in Abu Dhabi, has over 164 supermarkets and shopping malls. It employs over 50,000 people. Founded in year 2000, Alli said his group was interested in working with Nigerian farmers. Quality, affordability and hygiene are the watchwords of his company, he said. Also in a bilateral meeting with President Buhari was Sheikh Hussain Al Nowais, the Chairman of Amea Power. Similar meetings were held by the president with Sheikh Ali Rashid Lootah, the Chairman, Nakheel Properties and Limitless Group. Buhari also met with the CEO of Abu Dhabi Fund for Development (ADFD), Sheikh Mohammed Saif Al Suwaidi. ADFD has supported over 66 projects in 29 African countries. The president’s discussion with him was focused on rural solar power and water projects. He also met with Mr Jitender Sachdeva, the CEO of Skipperseil Group. An integrated energy company with operations in the manufacturing of substation equipment, discussions were on engineering, processing, construction of transmission lines and substations for utilities, institutions and industries. It was after the bilateral meetings that the president went to the venue of the AIM, which drew participants from 143 countries. A thunderous applause welcomed him to the venue. According to the organisers, the meeting was the largest gathering of corporate leaders, policymakers, businessmen, regional and international investors, entrepreneurs, leading academics and experts showcasing up-to-date information, strategies and knowledge on attracting FDI. A keynote speech at the AIM was Buhari’s second assignment in Dubai.The thrust of the president’s address was a call on world leaders to come up with proposals to create a digital world that is accessible, inclusive and safe for all. The president’s key words were: ‘‘More recently, we are also witnessing the use of the cyberspace to manipulate elections, subvert the democratic rights of citizens as well as propagate violence. On Tuesday, the president travelled to Abu Dhabi by road to meet with His Highness Sheikh Mohammed bin Zayed Al Nahyan, the Crown Prince of the emirate. Dubai to Abu Dhabi is an hour’s trip by road. The meeting was Buhari’s third assignment in UAE. During the meeting, the two leaders reaffirmed the need to work together to further consolidate on the strong relationship and mutual respect between the countries. They also discussed areas of enhancing and expanding mutual cooperation between Nigeria UAE. Buhari and the Crown Prince, who is also the Deputy Supreme Commander of UAE Forces, also discussed education, healthcare, agriculture, climate change and population growth. For an hour, President Buhari had an interactive session with Nigerians based in the UAE. Over 10,000 Nigerians are in that country. The session started by 4:24pm Dubai time. Moderated by Abike Dabiri, the presidential aide on Diaspora, the session climaxed with the grilling of Buhari by Nigerians in the country. Other questions were asked on what he is doing to diversify the economy and the gold mining challenge in the country, especially in Zamfara. One-after-the-other, Buhari responded to the questions. After recalling how he sent late Shehu Shagari and other top government officials at that time to prison over corruption cases, he said: “I have once ruled this country, some of you know that once upon a time I came in uniform and what I did was to arrest from the president downward. The president, vice president, governors and ministers, other than the president and the vice president, the others, I put them in Kiri-Kiri, and I told them they were guilty until they could prove themselves innocent. “And you know, subsequently what happened, we set up about six tribunals based on the geopolitical zones, and those who were ministers and governors were asked to justify what they had in the banks and physically on the ground relative to their legitimate earnings. “There were only two Nigerians then to my knowledge who were found to be very honourable, both of them are dead now: Bilyaminu Usman, a junior minister from Jigawa State and Adamu Chiroma, the Minister of Finance and Governor of Central Bank. They were incredible Nigerians. “But you know what happened, eventually, I myself was arrested, I was put in detention for three and a quarter years, luckily for me, I was so stupid, I didn’t take anybody’s money, so there was no bad publicity for me because they couldn’t find anything against me. On what to expect in his second term, he said the next level would be for the consolidation of the successes recorded in the first tenure. The president listed the areas to include economy, security and the fight against corruption. Buhari said the country’s economy is being diversified through the stimulation of the agricultural sector. Talking on the mismanagement under the 16 years of the Peoples Democratic Party (PDP), he said, “I think one of the leaders of those administrations made a slip of tongue by saying that they spent $16bn, not naira on power. But, where is the power and where is the $16bn? May be eventually by the end of this term we will get at it. Accompanied by Governors Abubakar Badaru, Godwin Obaseki and Abubakar Sani Bello of Jigawa, Edo and Niger states respectively, the president went straight to the airport from the venue of town-hall meeting. Others on the entourage included the Minister of Foreign Affairs, Geoffrey Onyeama; the National Security Adviser, Maj. Gen. Mohammed Babagana Monguno (rtd), and other top government officials.